This Ninja combo combines two critical weapons for every Shinobi warrior's arsenal in one convenient and mobile package. A trusty double edged sword and versatile kunai knives. The tempered 440 stainless steel sword blade comes complete with center cutouts and a ring pommel. Full tang, the blade has a two tone black and satin finish. The handle is cord wrapped to provide a secure grip. 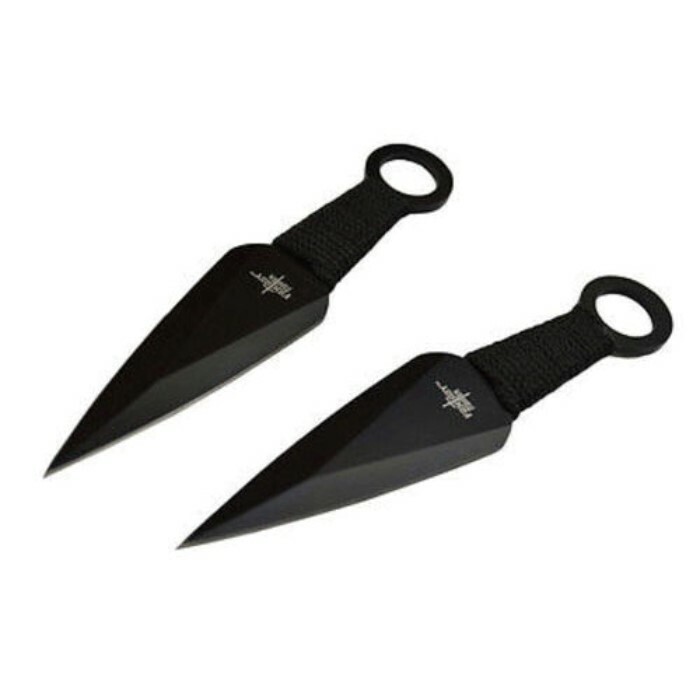 The set of two kunai knives are suitable for both throwing usage or as close quarters daggers. Each kunai is forged from one piece of steel and features a cord wrapped handle. All three of these weapons fit neatly within one nylon sheath. Each kunai knife has its own compartment on the sheath, and a back strap is included for easy carry while on the move. 1 x Ninja sword: 28 in. overall, 18 in. blade. 2 x Kunai knives: 5 1/2 in. each overall. 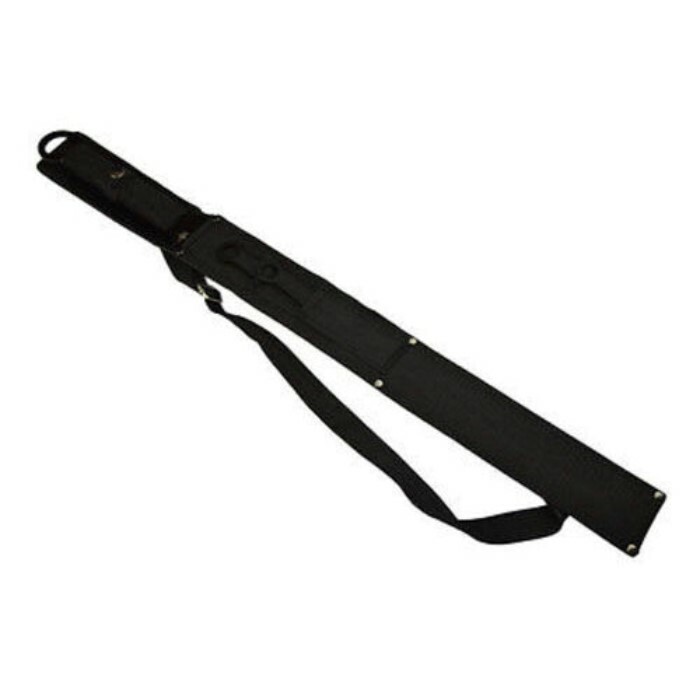 1 x Dual purpose nylon sheath with back strap and pouches for kunai knives. Wonderful set. When it originally came, was missing a kunai, but a single email brought a quick reply and a speedy resolution to the problem. You guys at True Swords are awesome! 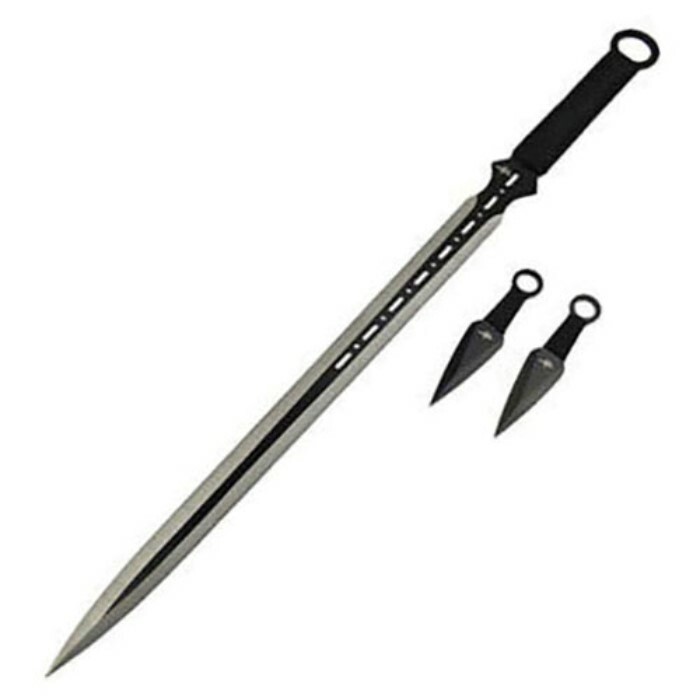 Also, amazing sword, easy to draw and resheathe, and kunai are well balanced. All in all, a great buy. Great. The blade was crafted very well, not sharp but only at the point. no problem, just sharpen in. the detail on the blade is too fine, and hollow indentations as well. very lift and swift a ONE HANDED BLADE, not two handed. I feel like Achilles from Troy with this one. swift, versatile. This is my first purchase from true swords and i must say it was a good one! 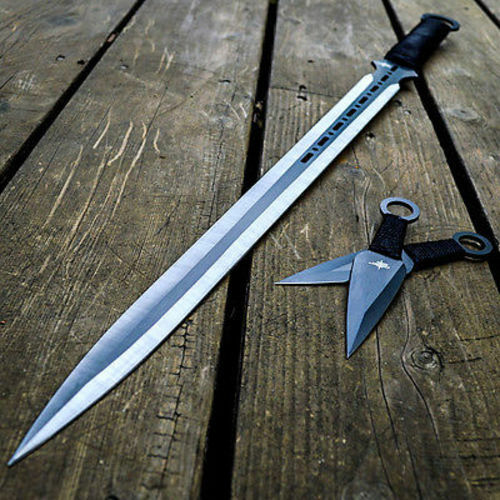 the sword is nice and sturdy and is fairly sharp, the knifes are also very well made and fit in my hand nicely. Definitely going to buy from here again! 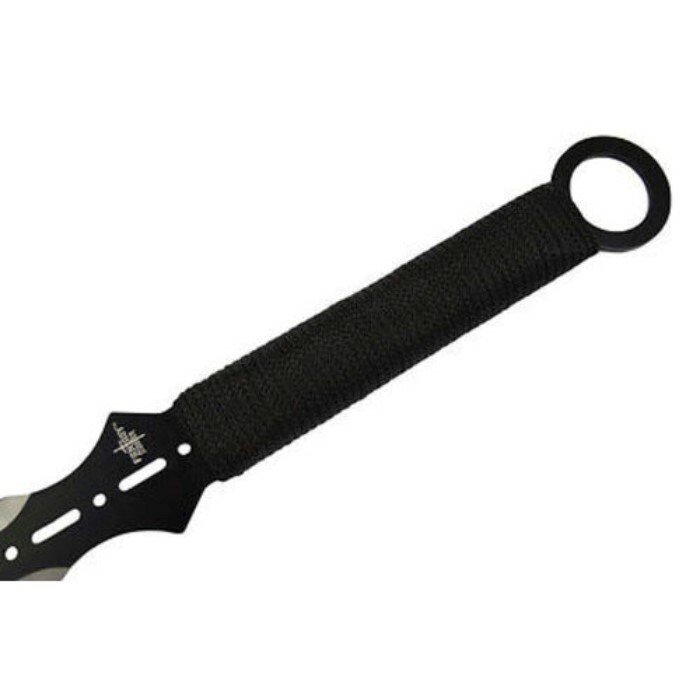 I received this product today and I got to say I love this product the kunai knives are small they fit in the palm of my hand which is good because if your a ninja you need a stealthy weapon also the kunai aren't sharp on the edges but you can buy a sharpener or whatever. 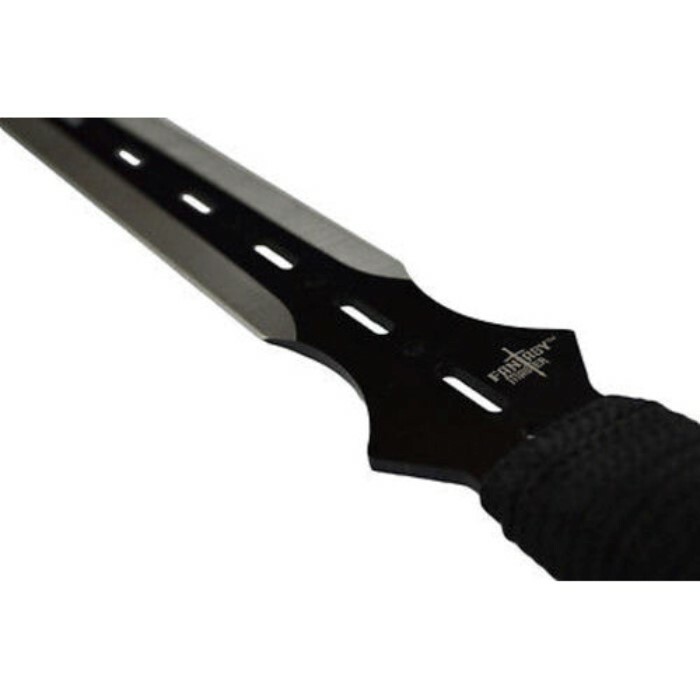 Anyways moving on to the sword it is very light weight the edges are sharp but not very sharp the handle very comfortable and finally the back strap you can adjust it to your desire and the blade and kunai fit in well no chance of you losing a kunia if your on the move but overall I am happy with this product and if anyone else is looking at this product I would recommend of buying this what you see in the picture is exactly what your getting.